For versatile, image-stabilized operation and clear and bright 12x images look no further than Canon's 12x36 IS III. Whether in the hands of a hunter scouting a target, a birdwatcher looking for their favorite finch or a sports fan watching the batter swing, these binoculars offer outstanding image quality, speedy operation and an elegant, compact design. 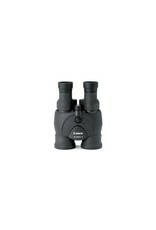 With 12x magnification and bright 36mm/1.42 in. objective lenses, the 12x36 IS III are engineered to perform beautifully both indoors and out. Canon's improved Image Stabilization (IS) technology helps deliver smooth, extended viewing without the need for a tripod, and Canon optics help provide bright, sharp and colourful, virtually distortion-free viewing. 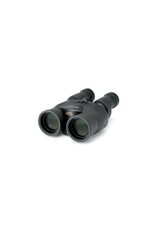 With extended use in mind, these binoculars feature long eye relief for comfortable use even when wearing glasses. No matter the user, no matter the situation, Canon's 12x36 IS III are a premium combination of high magnification optics and a surprisingly portable package. Canon's 12x36 IS III are versatile, powerful, lightweight and compact, perfect to use when hunting, on hikes, watching sports events, and more. They incorporate sophisticated Image Stabilization (IS), bright 12x Canon optics for detail and improved electronics for efficient performance day after day, all in a compact and simple design that's easy to carry all day. To achieve a stable high magnification view, without the need for a tripod, the 12x36 IS III feature Canon's advanced Image Stabilization (IS) technology for performance on par with Canon's EF series of lenses. Vari-Angle prisms are placed between the front lens and the main prism. 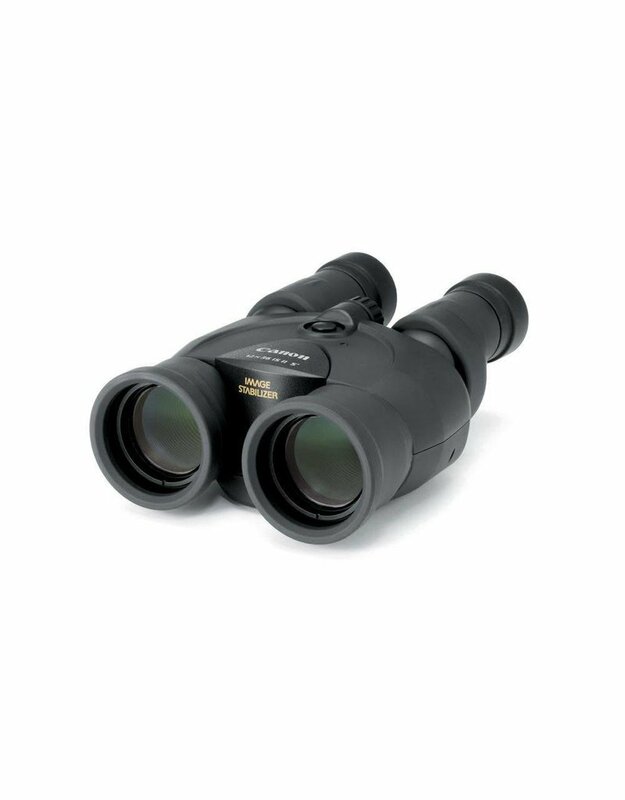 When the binoculars' gyro sensors detect vertical or horizontal movement, these prisms compensate and correct any movements or shakes for smoother panning, no matter the speed. A high performance microcomputer using advanced algorithms not only improves IS, it helps provide shorter startup times and more efficient energy consumption. This means a comfortable, stable field of view that can be easy to maintain, whether tracking deer in the woods, watching a football game from the stands or seeing the sights from the window of a tour bus. Canon's 12x36 IS III feature a refined optical system designed to provide a 12x close up view with incredible optics, offering performance that can compete with much larger binoculars. And with 12x magnification it's easy to see details that could be missed with the naked eye: the pattern of an animal's fur, the expression on the face of the goalie, the intricate beauty of butterfly wings and much more are brought closer with the 12x36 IS III. With an objective lens effective diameter of 36mm/1.42 in., the 12x36 IS III deliver an extremely bright view while remaining portable enough to carry all day. The minute the action starts, whether in a brightly lit arena, or outdoors at dusk, the 12x36 IS III's bright lenses display an impressive level of detail. Canon's 12x36 IS III use a Porro II Prism design. Because both the front lens and the eyepiece use convex-shaped glass, the binoculars' design necessitates a prism system between the front objective lens and the eyepiece to flip the otherwise inverted image that would appear. Porro type prisms are perfect for the 12x36 IS III's compact design because they deliver clear, bright images at high magnification with excellent sharpness, and minimal light falloff. Canon's 12x36 IS III deliver a sharp and flat image across the frame thanks to the addition of doublet field-flattener lenses in the eyepieces. Doublet lenses correct curvature of field, the image quality degradation typical at the edges of the image. Thanks to the doublet field-flattener, a sharp and even, wide field of view is displayed in the eyepieces. With enhanced power-saving electronics, the Image Stabilization (IS) system in Canon's 12x36 IS III is markedly more energy efficient than in previous models. Using AA alkaline batteries, the 12x36 IS III's IS system works for up to 9 hours. The 12x36 IS III are also compatible with nickel-metal hydride (NiMh) rechargeable batteries. In binoculars, the distance from the eyepoint where the image can be seen without obstruction is known as eye relief. In use, especially for extended periods of time, more eye relief can make for a more comfortable, sustainable experience. Canon's 12x36 IS III have excellent, long eye relief, providing a generous field of view that makes the binoculars comfortable to look through, even when wearing glasses. The 12x36 IS III have a refined, anti-reflective external design. This is especially helpful for watching birds and wildlife, or any situation where remaining inconspicuous is a priority. The 12x36 IS III, as with all other Canon lenses, use glass optical components that are made of lead-free glass for an environmentally friendly lens.